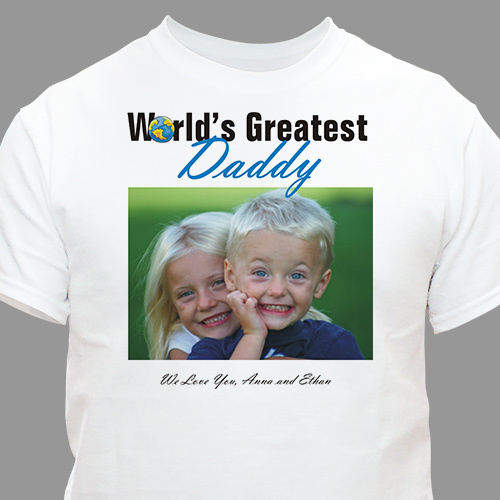 Our World's Greatest Photo Personalized T-Shirts are available on our premium white 100% cotton Personalized T-shirt, machine washable in adult sizes S-3XL. Every Photo Personalized Shirt includes FREE personalization with any messages and your own photo! Upload your favorite photo below. Please don't send any photos in the mail, electronic photos only. Please enter description of photo. (ex. two little kids laying in sand on the beach). Personalize your World's Greatest Personalized Photo Shirts with any name or title and an optional one line custom message underneath photo, (ex. We Love You, Emma and Jacob). This one fits the grandfather perfectly. Love it. OUTSTANDING - my son and grand daughter will love it ! !